Citroën’s latest addition to their local line-up takes the famous French company into a new segment in South Africa – the rapidly growing compact sports utility vehicle (SUV) market. Although there have been Citroën station wagons in South Africa before there has never been an SUV. The newcomer, the C4 Aircross, is a compact five-seater with a choice of two- or four-wheel drive with three trim and equipment levels: Attraction, Seduction and Exclusive. All models are powered by a 2-litre naturally aspirated petrol engine developing 113kW of power and 198Nm of torque. The Attraction and Seduction models are equipped with a five-speed manual transmission, while the Seduction and the range-topping Exclusive are available with a continuously variable “automatic” transmission. The intelligent 4WD on demand system is available on the range topping Exclusive model. It senses wheel slip and adjusts the split of power optimally between the front and rear wheels for maximum traction. The centre differential can be locked in really tough conditions to provide a 50:50 split between the drive to the front and rear wheels. LED daytime running lights on the Seduction and Exclusive models are integrated vertically into aerodynamic vents and make a vertical light signature, visible by day and night, in the same way as it does with the DS3 and C1 models. The rear windows are dark tinted. This new model features a raised driving position giving a clear view of the road, with the controls and instruments ranged around the driver in an efficient, ergonomic fashion. 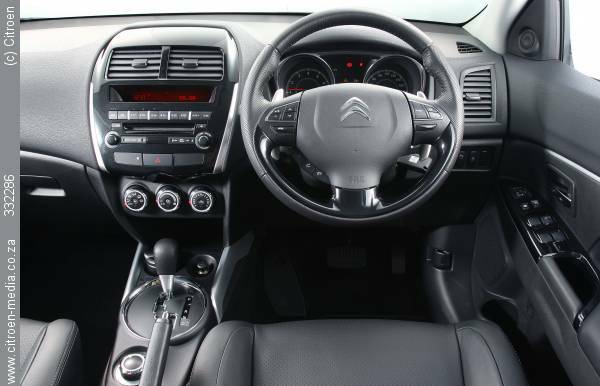 The steering wheel houses controls for the audio system on all models, with cruise control and Bluetooth hands free telephone operation on Seduction and Exclusive models. A multi-function onboard computer provides the driver with information regarding the current and average fuel consumption, range on remaining fuel, average speed and distance covered. Comfort and convenience features include manual air conditioning on the Attraction, with climate control in the other variants, together with automatic switching of the headlights and windscreen wipers, rear parking sensors. The big appeal of the interior is its spaciousness. Besides up to five occupants it houses a host of storage compartments. The large glovebox is lit and chilled (by the automatic air conditioning), while the front and rear armrests have two cup holders each. A 12V socket, USB port and auxiliary audio jack are all included in the standard specification on the top two variants. The audio streaming function allows music stored on a Smartphone or compatible audio drive to be played through the audio system using a wireless Bluetooth connection. The front seats provide excellent support and are multi-way adjustable. The rear seat backrest has two rake positions, while the rear seat backrests are split 60:40 and can be folded flat to increase luggage space, which is already generous at 384 litres with a full size spare wheel chosen especially for local road conditions and consumer demand. A large, glazed panoramic sunroof with UV protection and a one-touch electric blind is an optional extra on the Seduction and Exclusive models. It not only lets the occupants enjoy a view of the sky and adds to the feeling of spaciousness, but at night there are LED lights built into the guides of the sunroof that turn it amber. This novel ambient lighting can be adjusted for brightness of turned off. The running gear of the C4 Aircross has been fine tuned to provide the ride comfort one expects from a vehicle bearing the Citroën logo, while still providing very good road holding. The front suspension is of the Macpherson strut type with a coil-sprung multi-link system at the rear that incorporates a substantial (18mm diameter) anti-roll bar. Steering is by an electrically-assisted system. The Attraction and Seduction variants are fitted with 16” Flinders-style alloy wheels, while the Exclusive gets 18” Kanji-style wheels. Anti-skid ABS brakes with electronic brake force distribution (EBD) and emergency brake assist (EBA) are standard on all models, while the Exclusive also get an electronic stability programme (ESP) with hill start assist. All models have front fog lamps, while the Exclusive is fitted with Xenon headlamps. Headlamps are manually adjustable in the Attraction and Seduction variants and automatically adjusted on the Exclusive. “The Citroen C4 Aircross is the first foray for Citroen into the compact SUV market on South African soil as a segment of vehicles that currently reflects the second highest growth percentage behind the B segment. As a country which shows a buying bias towards SUV, this product is significant and essential to place Citroen on the map and thus a fundamental access card into the South African buying psyche,” says Grant Bowring GM Marketing for Citroen South Africa. The Citroën Aircross range is covered by a 3-year/100 000km warranty and a 5 year 100 000km service plan with the option to upgrade the warranty to 5-years/100 000km, while FreeDrive, includes the extended warranty and also incorporates a 100 000km maintenance plan. 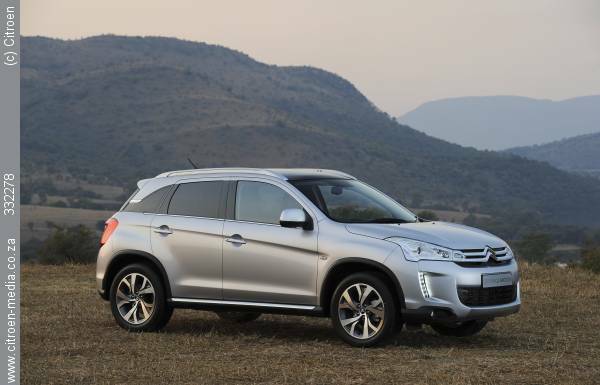 This entry was posted in News and tagged 2012, Aircross, C4, Citroën, petrol, South Africa, SUV. Bookmark the permalink.